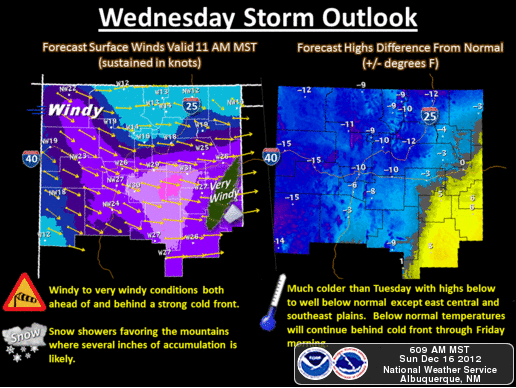 Next Storm Arrives Wednesday - First Look At Our Christmas Wx. 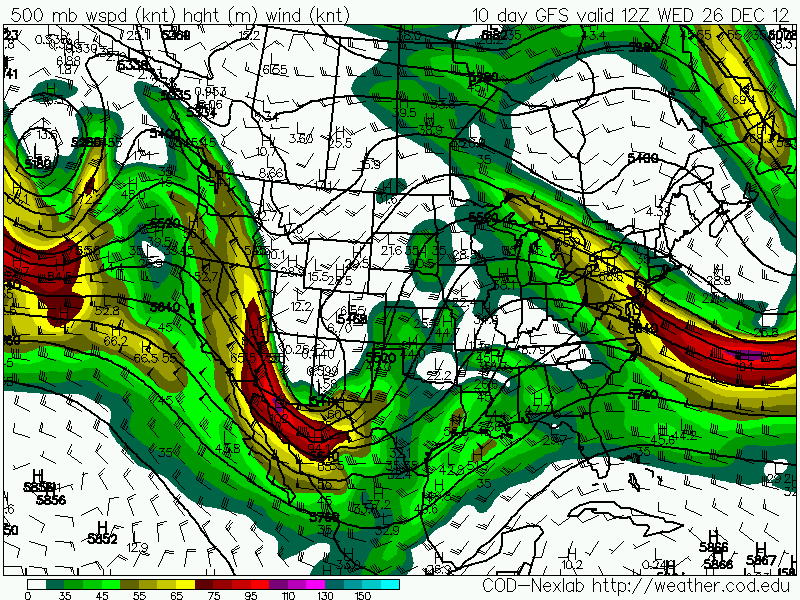 Valid At 12Z/5 AM MST Wednesday December 19, 2012. 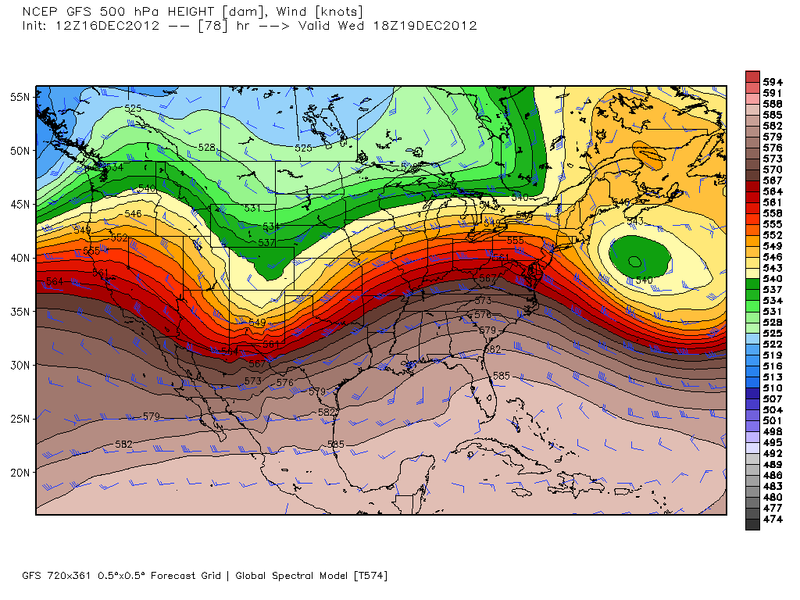 Valid At 18Z/11 AM MST Wednesday December 19, 2012. 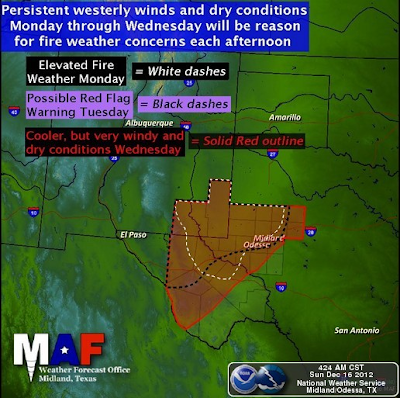 Midland NWS Outlook Mon - Wed.
Lubbock NWS Outlook For Wednesday. 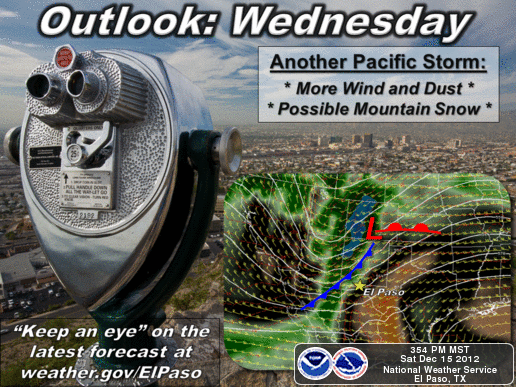 Albuquerque NWS Outlook For Wednesday. El Paso/Santa Teresa NWS Outlook For Wednesday. Our next storm will arrive in New Mexico by Wednesday. 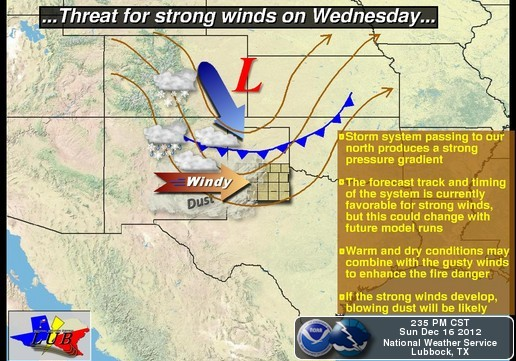 For southeastern New Mexico this next storm will be another wind and dust producer. Snow will again be possible across the Sacramento and Capitan Mountains. Although the best chances for snow will be across the western and northern mountains of the state. Thankfully this past Firday's howler wasn't nearly as bad as was forecast, not that I am complaning. I never get upset when the wind dosen't blow as hard as forecast. Guadalupe Pass did clock a peak gust to 81 mph. Most of the reporting stations across the southeastern plains reported gusts between 45 - 55 mph. Both the European (ECMWF) and the U.S. GFS computer models forecast a trough of low pressure at the mid of the atmosphere to sweep eastward across the state on Wednesday. With the core of the trough moving well to our north, you guessed, just a lot of wind and dust for us here in the southeastern plains once again. Our afternoon highs are once again forecast to rise above normal levels Monday into Wednesday. We should see highs on Monday ranging from the upper 60's to near 70, the low 70's to the upper 70's on Tuesday, and the mid 60's on Wednesday. A few daily record high temps will be in danger of being challenged on Tuesday, and a few of us might even see that 80-degree reading again. That's just ridiculous for the middle of December. First Look At Our Christmas Weather. 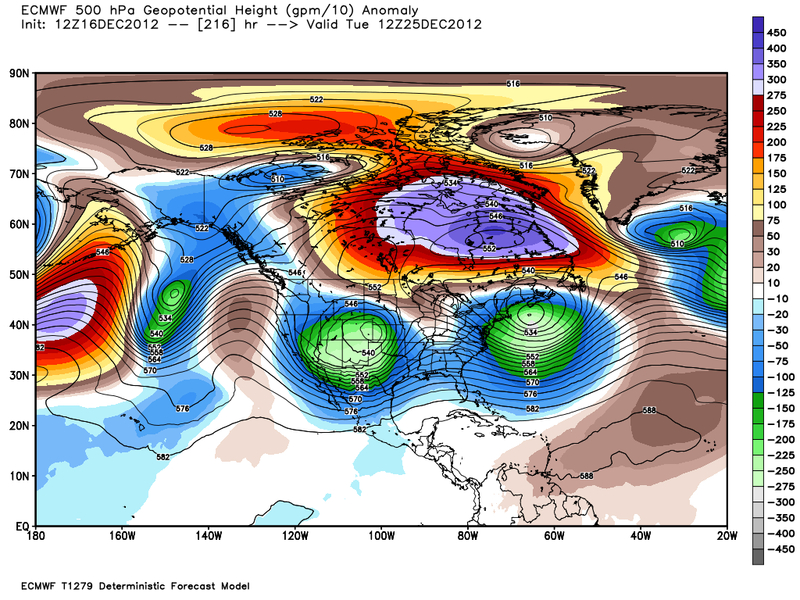 This Mornings 12Z/5 AM MST NCEP GFS Ensemble 500 MB Forecast. Valid At 12Z/5 AM MST Christmas Morning, Tuesday December 25, 2012. Valid At 12Z/5 AM MST Wednesday December 26, 2012. 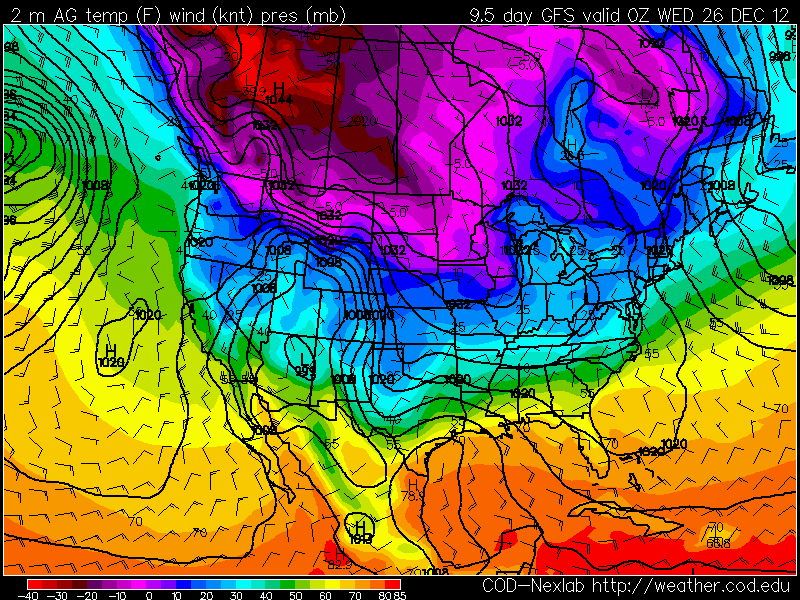 This Mornings 12Z/5 AM MST GFS Temperature Forecast. 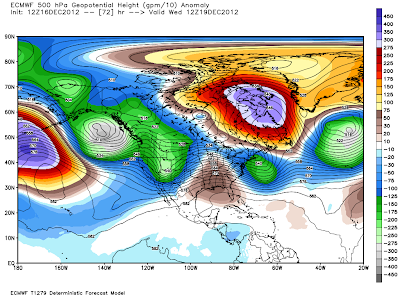 Valid At 00Z/5 PM MST Christmas Day, Tuesday December 25, 2012. 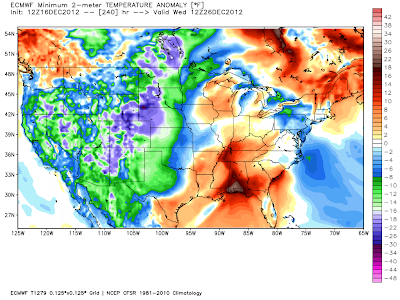 This Mornings 12Z/5 AM MST ECMWF Temp Anomaly Forecast. Valid For 12Z/5 AM MST Christmas Morning, Tuesday December 25, 2012. 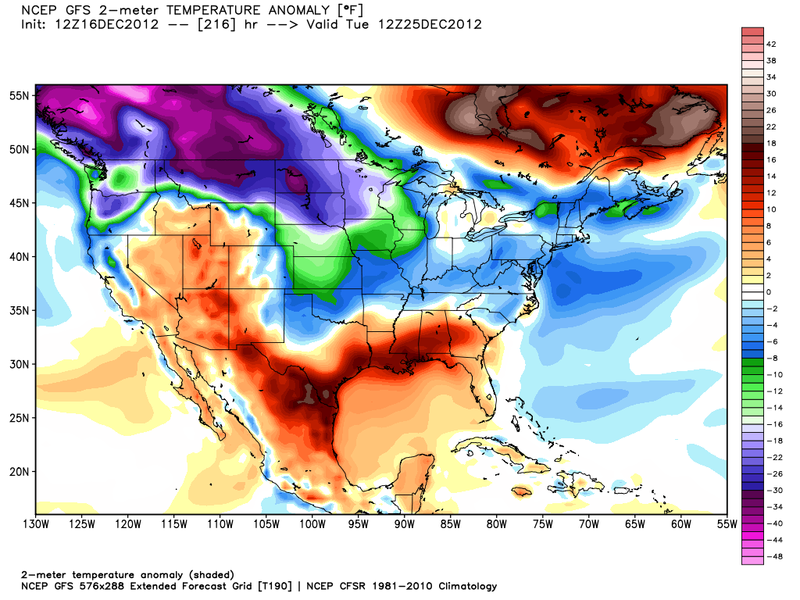 This Mornings12Z/5 AM MST GFS Temp Anomaly Forecast. This Mornings 12Z/5 AM MST GFS Snow Depth Forecast. I must remind you that when you look at the forecast maps posted above concerning our Christmas outlook this year, don't get too excited about these forecasts just yet. We are nine days away from Christmas, and I guarantee you that these model forecasts will change, daily. So I have very little confidence in any of these forecasts this far out in time. What should be noted though is that we have undergone the advertised pattern change that I have been talking about. With trough after trough of low pressure sweeping through the Desert Southwest, we are cooling off, and the mountains are picking up some snow, finally. Ski Apache, located just west of Ruidoso, New Mexico, has picked up 9" of new snow in the past 24-hours, bringing their seasonal total up to 17". A CoCoRaHS Observer reported 7" of new snow 1.8 miles southwest of Cloudcroft Saturday morning, while 4.5" of snow was noted in town. 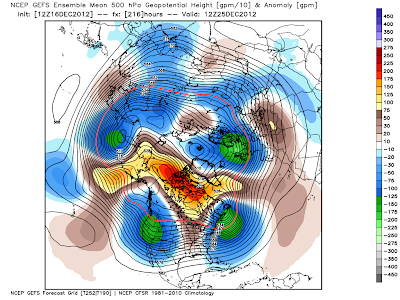 All indications continue to point towards a stormy and unsettled pattern over the next ten days. Just what that means for us locally is unclear this far out. Will we have another white Christmas like last year...I seriously doubt that. We have a better chance of winning the lottery than we do of seeing a half a foot to a foot of snow on the ground again this Christmas morning. However, don't write off a white Christmas just yet. 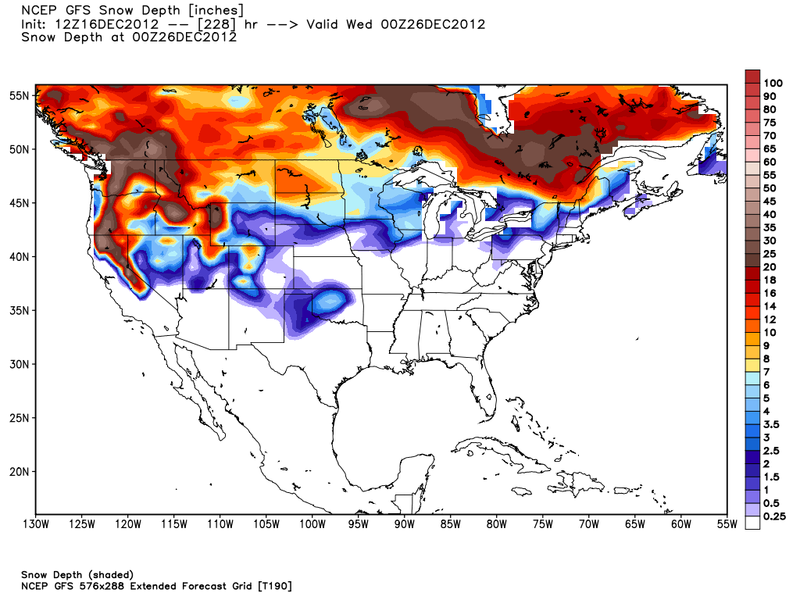 Anything is possible including another white Christmas this year given the recent model trends. I will post another update on our local Christmas weather outlook in a day or two. I really love your site. It's always so updated that I kept it bookmarked and check on it twice a day. This site is really helpful especially when there are storms coming. Your site is always so amazing. I always manage to get updates and real time information as fast as possible. Keep up the great work guys.